Use TB2QA5Y to reference this item. Speeding, inattention, experience, fatigue, drugs and alcohol and illegal manoeuvres are given reasons for causing accidents. You don’t have to be smarter then a fifth grader to work out that YOU have the power to do something to control each of these factors. Rolling stops kill, driving and riding responsible helps save lives! Respect those around you, watch for all users of the road! Stop driving distracted, look for bikes! Bikes have every right a car does, please share the road! Come and join us at “Todies Wild Ride” in the geocoin discussions, read, write and learn "watching for bike safety"
This entry was edited by az_pistolero on Monday, 25 July 2011 at 04:18:47 UTC. This entry was edited by az_pistolero on Monday, 25 July 2011 at 04:21:18 UTC. 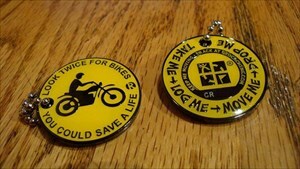 discovered it in the cache "livestrong".. will drop it off somewhere this week in phoenix. Forgot to log when I dropped it off. Discovered in the hands of WR7X in Pendleton, OR.